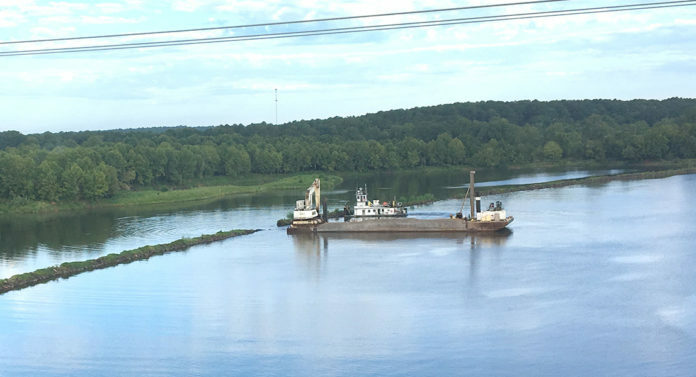 Many may have noticed a barge operating just north of the Grand Ecore Bridge over Red River. The Corps of Engineers contractor, Luhr Bros based in Columbia, Ill.,, is performing work on the bank directly below the Grand Ecore Visitor Center. Work includes constructing a dike along the bank of the river for bank stabilization purposes. The wall of rock, or dike, is designed to combat the problem of erosion as well as prevent future instances. A spokesperson with the Corps of Engineers said the project should be complete by Sunday.